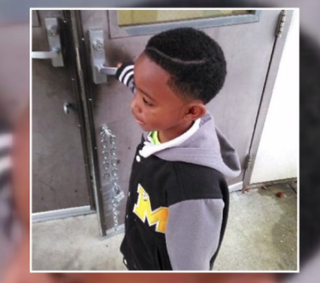 A 7-year-old Birmingham, Ala., boy was facing suspension over a part in his hair. "He was, like, upset, and he said I had to come get him out of school because he was being suspended," Keisha Rembert told WBRC about when she got the call from her son Rashaad Hunter. "He was pulled out of class, saying that he had a design in his head; but it really wasn't a design, it was a part." Didn't matter that Rashaad was an honor roll student at Greenwood Elementary School in Bessemer, Ala., and had never been in trouble; the school deemed the part in his head a design and therefore against school regulations. "He was walking with his head down; when I saw him, he was, like, teary-eyed at first because he doesn't want to be suspended for no part in his head," Rembert told the news station. "I told him, 'Don't hold your head down … continue to make these A's and B's because that part is nothing.'" She added: "They need to notate or clarify what is a design? SpongeBob, a part, a tennis shoe, whatever." Bessemer City Schools Superintendent Fred Primm, who had not seen Rashaad's haircut, told the news station that it is difficult to note what is an acceptable hairstyle, so the district handles each situation on a case-by-case basis. The news station provided a photo of the Rashaad's haircut for Primm's evaluation. "We allow small parts, but not excessively long parts that are done as designs. That part in that young man's hair would be considered a design," Primm said. He then added, "The principal has decided not to suspend the child."